Home » ★★★☆☆ » Rabbit and The Shed. We have also the wines from success, said our waiter, in a thick accent of indeterminate origin, his ponytail pulled back so tightly that he had given himself a Croydon facelift. We decided to give the wines of success a miss when we worked out that they were wines from Sussex, not that I’ve got anything against English wines per se, we just fancied something punchy and aromatic and we weren’t sure they’d deliver. This was my first visit to The Shed but my second visit to a “Gladwin” enterprise under which umbrella sits The Shed and Rabbit, on the King’s Road, visited only days ago with mixed results. The three Gladwins are brothers, all connected to the restaurant industry in different ways. There is also a Gladwin farm, down in (you guessed it) West Sussex and they have their own vineyard. Many of the ingredients used in the two restaurants come from their own farm and they highlight the ‘sustainable’ nature of their operation. So far so Daylesford. The décor in Rabbit is not in the Bamford neutral style, more farmyard-on-acid, with bright colours, some tractor-seat chairs which don’t immediately invite and bold abstract art on the walls. My friend S and I were seated at the back, at a large round table, with a view of everything. Tip: ask for that table. The Shed, a space I prefer don’t ask me why, is a slightly more rickety-ramshackle affair, with odd-sized tables, some on the Alice-in-Wonderland spectrum of tiny. I quite like the messy farmyard/potting shed vibe in both and though not quite fitting into either locale as a look, it’s not without charm. 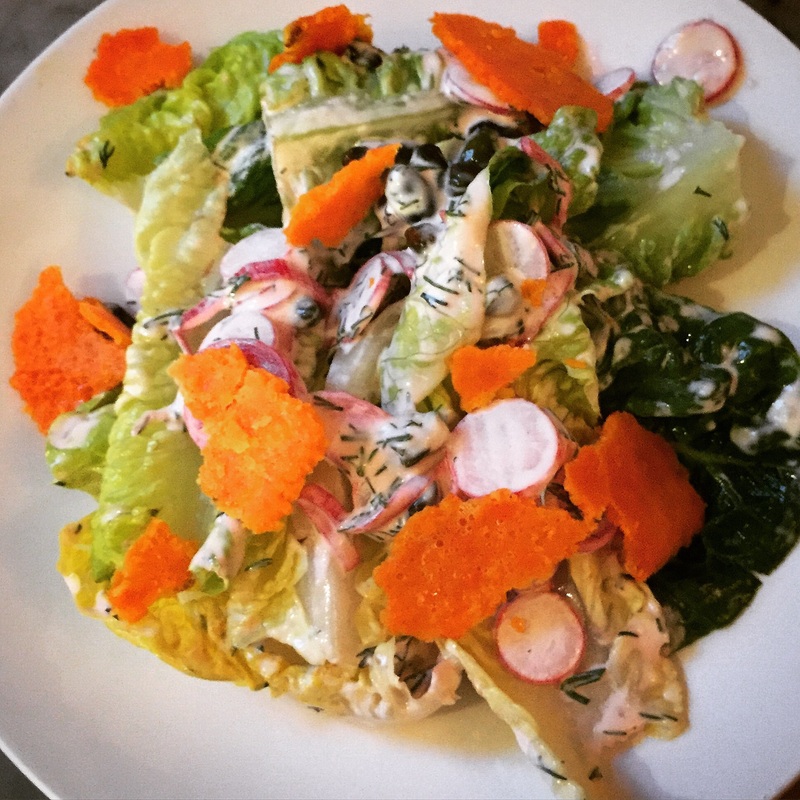 For every red-trousered denizen of Chelsea at Rabbit there’s a hipster-style trustafarian at The Shed. 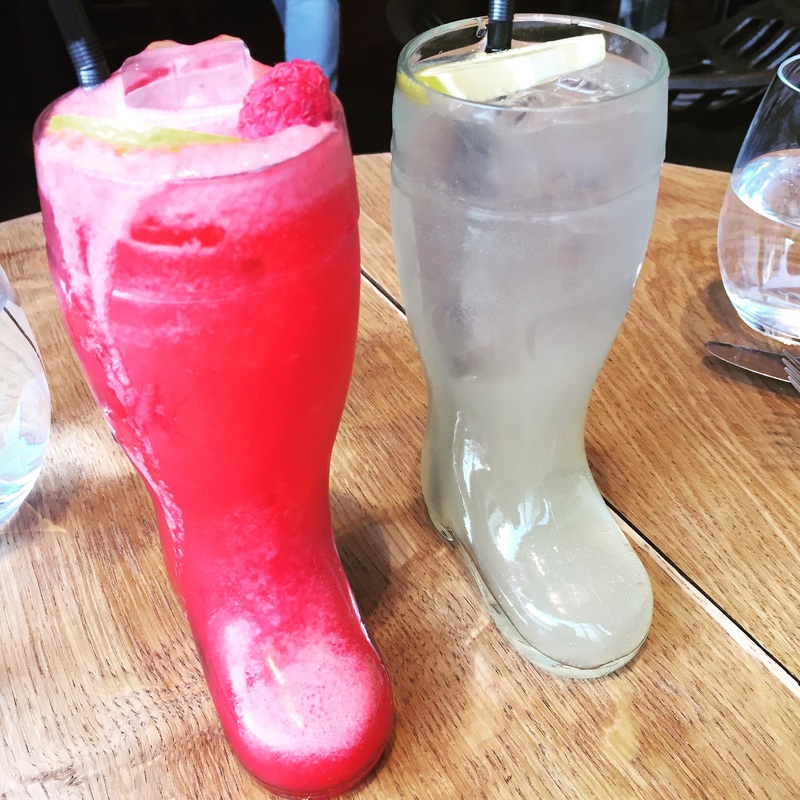 The clientele in both is clearly foraged from the local environs (sustainable, natch) and that may or may not float your boat, depending on the colour of your trousers or the size of your trust fund. My companion H had tried to book The Shed for 7pm. Without discussion he was told that the table would be available from 7:15 to 9:15. No ‘is that alright’ or some such. If you order as much as we did, then you may start to feel the hand of time propelling you out of your seat, before you’re quite ready. The menus at each restaurant are very similar and are divided into “Mouthfuls”, “Slow cooking” and “Fast cooking”. 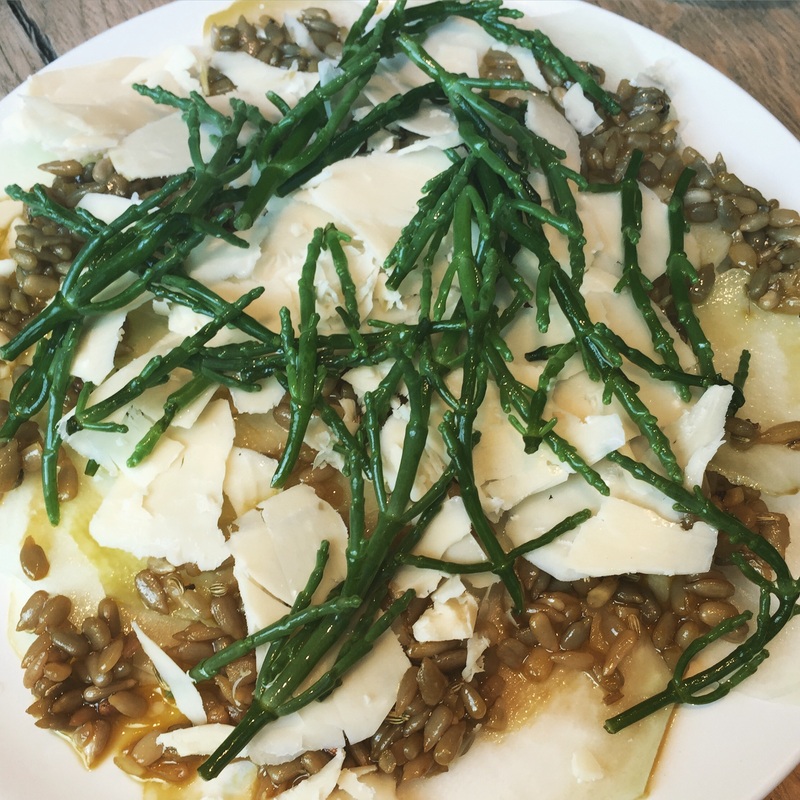 The fast and slow thing is evidently nonsense, as I had the same dish, kohlrabi carpaccio at Rabbit under ‘Slow’ for £6 and at The Shed under ‘Fast’ for £7.50. And the cheaper dish at Rabbit was substantially bigger. And better. I think they should ditch the whole fast/slow thing because it’s meaningless. Perhaps cooked and raw would be better. And even though some of the dishes at each were identical, the standard of cooking was markedly different. A chorizo with labneh and crispy kale at Rabbit was overly rich and the crispbreads wedged into it were too thick and hard to bite into and lacked flavour, like over-baked cardboard. By contrast the same dish at The Shed had delicate, lightly-crisped tasty crackers and the chorizo didn’t overpower the dish. The broad bean hummus was, at Rabbit, so firm that even with the over-baked cracker I struggled to scoop it out of the bowl. At The Shed, a perfect, soft yielding texture. At Rabbit, I felt that whilst its heart was in the right place, the execution lacked finesse and some dishes were just ill-conceived, like the gin-cured trout with horseradish curd and pickled rapeseed. 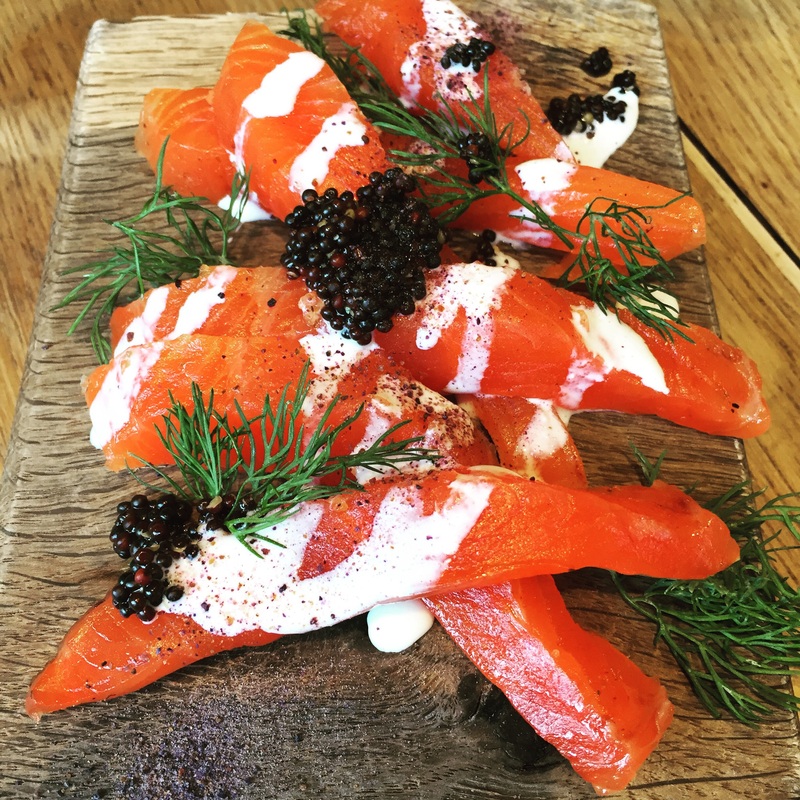 The trout, which came beautifully arranged in crisscrossed tranches was dry and too chewy. The promised curd was a drizzle of white nothing over the top, like watered-down yogurt. No heat. Nothing. 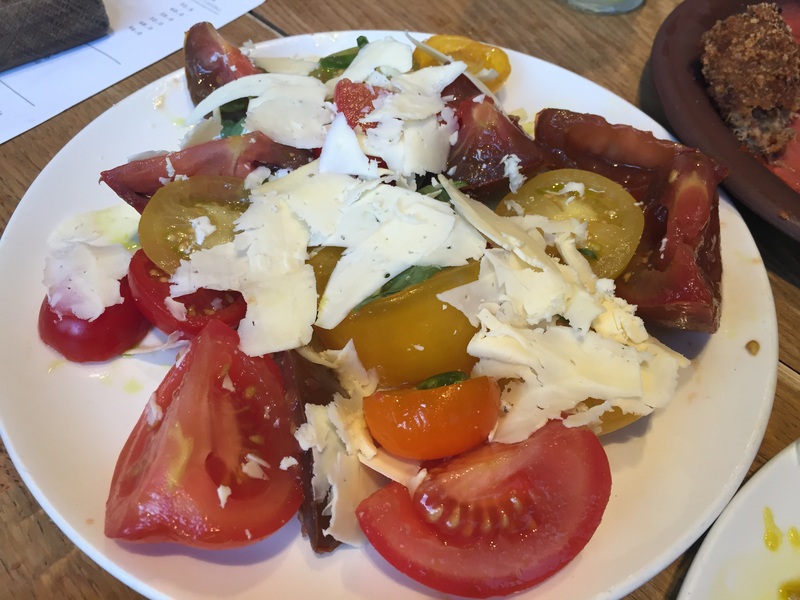 The Nutbourne tomatoes were a few “heritage” tomatoes, scattered round a plate with some very lovely slices of Caerphilly laid over the top. No sign of the advertised rose geranium and just a few whole pistachios and the tomatoes were just put on the plate like you’d do at home if you were making it for yourself and didn’t much care how it looked. They could have done so much more with that. 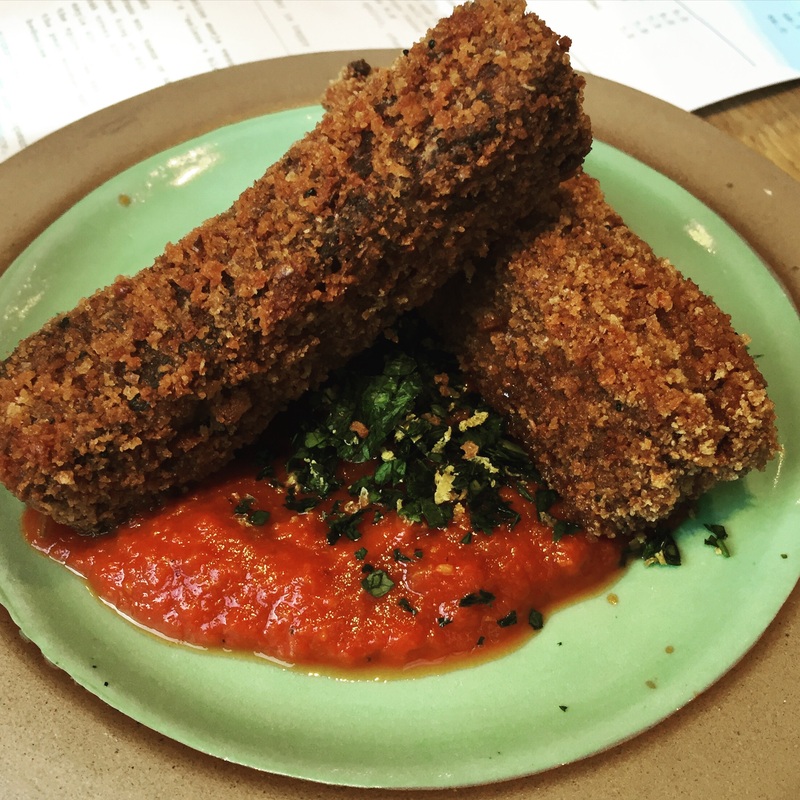 We did love the lamb chips though, big logs of deep-fried lamb with a spicy harissa sauce on the side. Not pretty but very good. 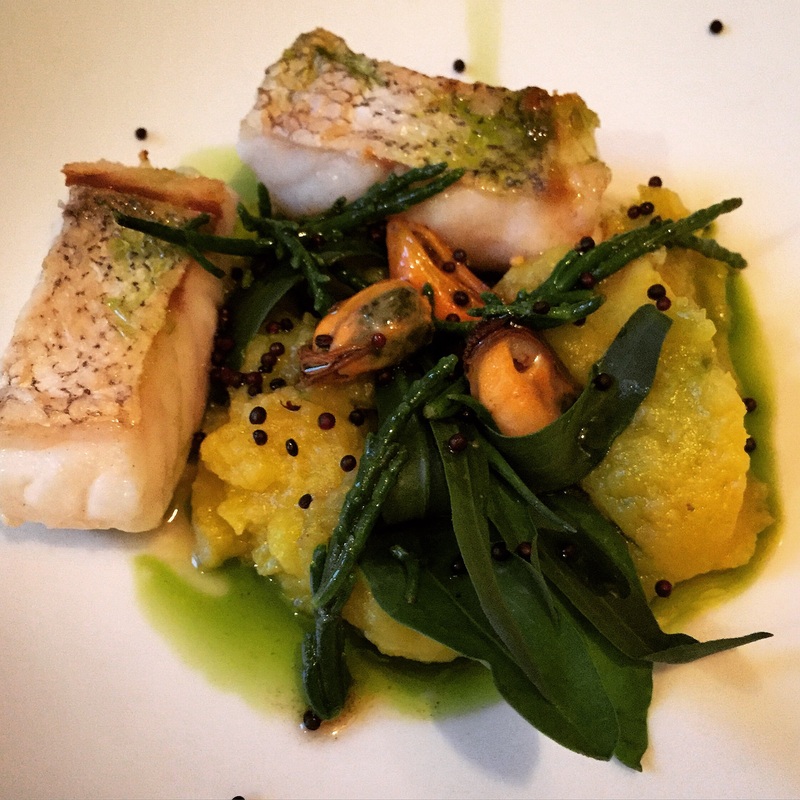 I never want them to end, says S.
Much more elegant plating was evident at The Shed and the hake, lemon potato samphire and sea aster with mussels was a dish that really worked. Two fairly small pieces of hake though, the size of mini Mars Bars, not feeling like great value at £10 but a dish I’d order again. 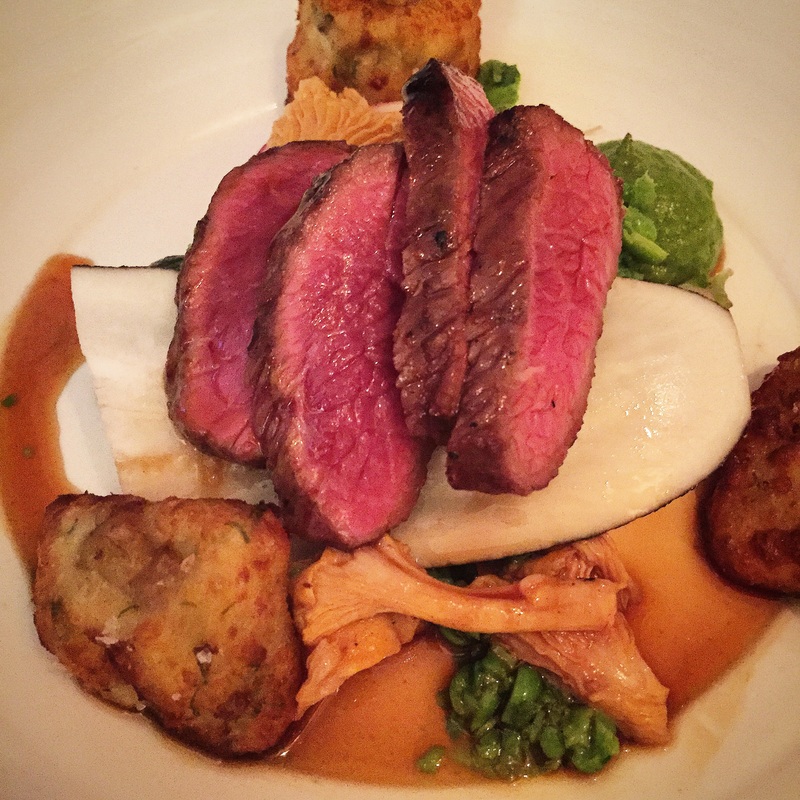 Likewise the meltingly-soft lamb, with Jersey Royal gnocchi. At 9.05, with ten minutes to go the waiter gave us the dessert menu. This was the waiter who winked at me any time I said something to him. Either that or the ponytail was pulled back so tight it had damaged his optic nerve. At 9.06, he came back to ask what we wanted. We said we hadn’t looked. At 9.07 another waiter asked us the same question. I am afraid that we both burst out laughing and he’s probably hating us, even now. But really. We didn’t, in the end and we ran out of time, only having a two hour time slot. 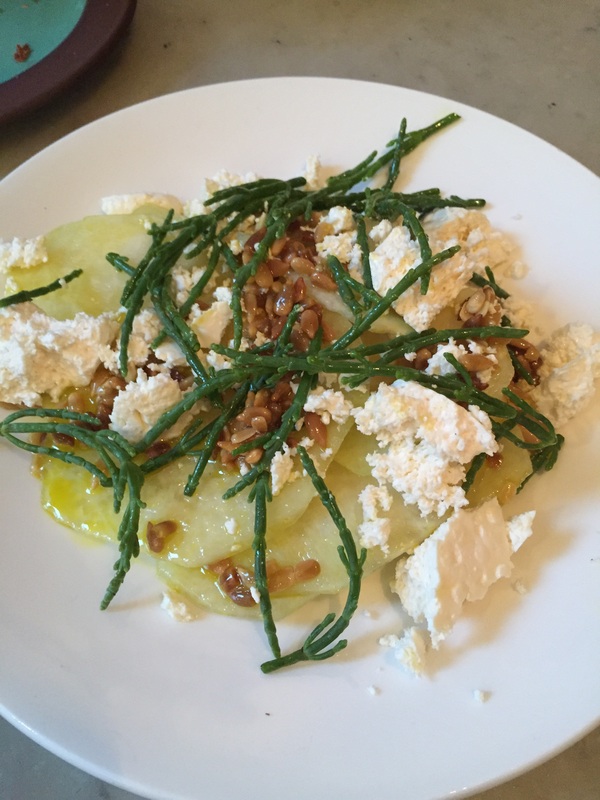 The Verdict: They try hard and the focus on unusual British ingredients is admirable. They are very lovely on Instagram and I wish I could be more positive. The menus are inviting but too often, named ingredients are difficult to find and the menus would benefit from little more explanation. The discrepancy in the quality of the cooking needs to be addressed; it really was quite marked. No-one is expecting fine dining but it does need to be consistent and on the night I went, Rabbit just wasn’t quite up to the mark and there were too many dishes that weren’t sufficiently well-executed and a little meh. I’d love them to get a better chef because the concept is great and when it works, it’s quirky, interesting, sincere and bold. Carpaccio -Rabbit. Rabbit wins this round. Ruby gem salad. Not sure it was ruby as in red. Nicky, Isabelle and I ate at Rabbit a few weeks ago and had a reasonably good meal. Some interesting combinations and some more than okay tastes. So maybe the chef that night has moved on. But I don’t like lots of small plates so currently don’t plan to return. Most of the red trousered Chelsea crowd must have been at Rabbit that night. As the decor is an extraordinary combination of rusted corrugated iron and farm implements, we couldn’t help laughing at the thought of elegant European tourists on the Kings Road looking in through the window… Or the farmhouse style front door. It is rather odd but at least it has a bit of its own character. 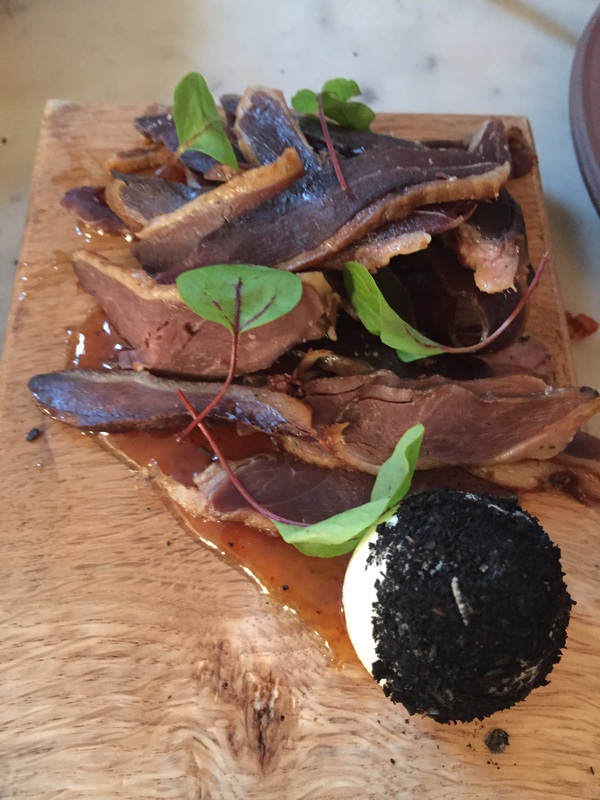 I thought The Shed was much better, I don’t mind sharing plates (as long as I can order). Where’s next on your list ? Good to bump into you at Rabbit the other week, Nicky. I liked it and The Shed more than you did I think. I found it refreshing and highly rated the staff, especially at The Shed. The mushroom marmite eclair at Rabbit was so good my dining chum and I immediately ordered two more. I recognise some of your comments although the broad bean houmous consistency was better at Rabbit. I guess you have a point about variations. Still, I would recommend either if looking for something quirky and an honest attempt to use seasonal and relatively close-to-hand ingredients. You didn’t quote me re: the lamb chips I “never wanted them to end”. Melt in the mouth! Hi Nickie. David recommended your blog as a good example of the art as I am starting one charting the life, loves and adventures of Captain Crapper – thought you’d heard the last of him? Anyway, keep it up – who’s a clever girl then? How very lovely to hear from you and here of all places. I hope you and Theresa are keeping well – I hear bits from the lovely Barry every now and again. Good luck with the blog! Hi Nickie, thanks for responding. Treeze is fine, but alas I’m not. I suffered a strangulated bowel which resulted in major surgery, which has slowed me up something chronic, but am I disheartened? You betchya I am. I shall read your bogs with interest!